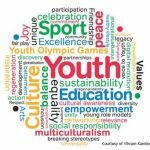 At the 2018 Sports and Society Conference Oskar Harmon participated in the panel “Activism in the 21th Century”. He presented his work on the confluence of patriotism, race, and politics in the 2017 NFL season. The conference was hosted by the College of Mount Saint Vincent, NY on October 26, 2018. Professor Oskar Harmon has been invited to serve a three-year term on the American Economic Association Committee on Economic Education, ending December 31, 2020. The Committee organizes the program for the annual Conference on Teaching and Economic Education (CTREE) and the Economic Education session for the annual ASSA meetings that goes into the AER P&P. During the UConn Metanoia on Racism November 8. 2017, Professor Oskar Harmon participated in the panel: Taking a Knee, Raising a Fist: Race, Sport, and Politics in Historical Perspective, with Professors Joseph Cooper, Sport Management, and Jeffrey Ogbar, History. The panel topic was the protest act of taking a knee during the pre-game ceremony of a football game was started in Sept 2016 by NFL player Colin Kaepernick. President Trump’s Tweet: The issue of kneeling has nothing to do with race. It is about respect for our Country, Flag and National Anthem. NFL must respect this! ignited a national referendum, and in the following weeks, taking a knee became a widespread event at professional football games. At UConn, Metanoia has become tradition wherein the University community sponsors workshops and panels around an important issue confronting the university, the state, and the nation. This semester the issue for Metanoia Day was racism. 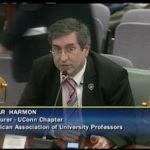 On February 21, 2017 Professor Oskar Harmon provided te stimony before the Connecticut State Senate Labor and Public Employees Committee, in opposition to SB 596 – An Act Concerning the Definition of Managerial Employee. 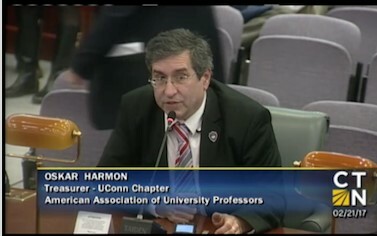 On March 9, 2017 Professor Harmon provided testimony before the Connecticut State Assembly Higher Education Committee in opposition to HB 971 – An Act Concerning the Promotion of Transfer and Articulation Agreements. At the symposium “Understanding Our Neurodiverse World: Teaching Business and Economics to Students Who Learn Differently,” on Saturday, October 1, 2016, Professor Oskar Harmon gave an invited presentation on Universal Design in Online Instruction. The keynote speaker was Paul McCulley, former chief economist and managing director at Pacific Investment Management Company (PIMCO). The other speakers at the day long symposium included Peter Fisher, J.D., senior lecturer at Dartmouth College’s Tuck School of Business, and Manju Banerjee, Ph.D., VP of Research and Innovation at Landmark College. The symposium was sponsored by the Morgan Le Fay Center for Advances in Business, Economics, and Entrepreneurship, Landmark College, Putney, VT.
P rofessors Oskar Harmon and Owen Svalestad, and Paul Tomolonis (PhD Candidate) participated in the Sixth Annual Conference on Teaching & Research in Economic Education, June 1 – 3, sponsored by the American Economic Association Committee on Economic Education. Oskar Harmon moderated the panel session “The Experience of Managing a Team in the FED Challenge Competition: Pointers and Pitfalls”, and Owen Svalestad presented “The First Timer Experience”. Oskar Harmon and Paul Tomolonis presented the paper “Can Social Media be an Effective Tool for Discussion in the Online Classroom?”. The paper makes a comparison between the use of social media and traditional Course Management System (CMS) discussion groups in a fully online (Microeconomic Principles) course. 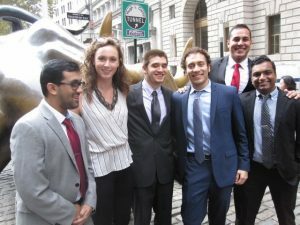 Using the experimental design of a randomized trial, the paper tests the popular hypothesis that students using social media (Facebook discussion group here) have greater engagement with the class and higher learning outcomes relative to students not using that platform for coursework (the CMS control group here) because of the ease of use and student familiarity with social media. Our findings were contrary to this popular hypothesis with lower levels of engagement and learning outcomes for the Facebook groups compared to the CMS discussion groups. We attribute this to the more casual and less formal environment of social media compared to the CMS since students postings were shorter via the social media discussions. Prof. Harmon was a panelist at an event celebrating the 50th anniversary of the Voting Rights Act of 1965. The panel addressed voter disenfranchisement including current/past court challenges to the Voting Rights Act, and stricter voting requirements, following passage of this landmark legislation. 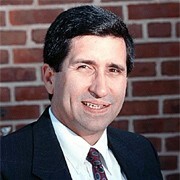 The panel was moderated by Professor Beth Ginsberg (UConn Political Science). The panelists were US Congressman Jim Hines; Scot X. Esdaile – CT NAACP State Chair; Professor Harmon; Khalilah L. Brown – Dean Quinnipiac University; Rev. Tommie Jackson – Faith Tabernacle Missionary Baptist Church; Michael Pollard – Chief of Staff for Stamford Mayor David Martin; Jasmine Pierre – Future 5 of NAACP; and Peggy Reeves – CT Secretary of State Election Affairs. The event (April 11) was attended by approximately 75 students and community members. It was held in the main concourse of the Stamford Campus. 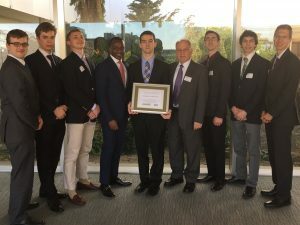 It was organized by the staff of Congressman Jim Hines; Terrence Cheng, Director of the Stamford Campus; Jack Bryant, President NAACP Stamford Chapter; and Professors Ginsberg and Harmon as part of their Spring 2016 Service Learning Courses. 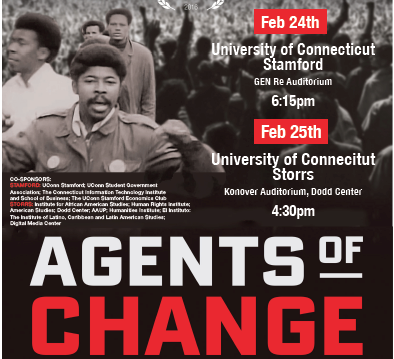 Professor Oskar Harmon has arranged for the screening of the film “Agents of Change” at the Stamford Campus (2/24 at 6:15 pm) and at the Konover Auditorium on the Storrs Campus (2/25 at 4:30 pm). Admission is free, open to the public and will have a reception and post screening discussion with the co-producer Abby Ginzberg and writer Ibram Kendi. 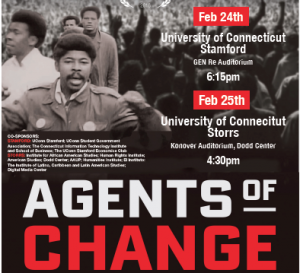 Also on 2/25 at the Storrs Campus, Abby will present a seminar on documentary film making, and Ibram will present a seminar on racism and diversity. The event is co-sponsored by 12 UConn groups: Institute for African American Studies, Human Rights Institute, American Studies, Dodd Center, AAUP, Humanities Institute, El Instituto: The Institute of Latino, Caribbean and Latin American Studies, Digital Media Center, UCONN Stamford, UCONN Student Government Association, The Connecticut Information Technology Institute and School of Business, and the UConn Stamford Economics Club.